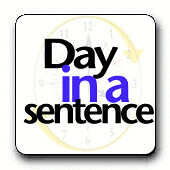 I would like to invite you to participate in the weekly Day in a Sentence feature. It’s easy. It’s fun. It’s informative (uh-oh — that always turns off the kids). Just boil your day or week down into a concise sentence, use the comment feature at this post here to submit (they will sit in moderation for a day or so), and then on Sunday or Monday, I will compile them all and share with the world as another post. Please leave a blog address, too, if you have one to share, as we create virtual connections amongst us all. I will be working with teachers at the Hudson Valley Writing Project tomorrow on a podcasting workshop and I will be having them do this activity and creating a group podcast, so we will have some other voices this week. But we still want you! Once again, I encourage folks to maybe try their hand at podcasting, either through the awfully-easy-to-use site PodcastPeople or create an MP3 file and ship it my way at dogtrax(at)gmail(dot)com and I will host your voice for you (for free!!). Today marks the first official time I am in charge of the Day in the Sentence feature and I am happy to report that we have a lot of people submitting their words to our collective voice. My aim is to keep the feature running for now here at this site, but to eventually pass it off to the community of bloggers and have others guest-host the feature. I imagine our friend, The Reflective Teacher, would enjoy knowing that his idea can blossom into a community of teacher-writers who connect every week. We’d still like to know how your week went and so feel free to add your comments to this post and leave a blog address, too, as I try to create a web of contacts. And I hope you return next week with some more of your writing, and possibly podcasting your voice. Spread the word — build a community. Some bad news came this week, as some of fans learned that The Reflective Teacher is taking a break from blogging. He has been incredibly generous with his time and resources and got many of us working each week on his Boil Your Week/Day Down to a Sentence. It’s an idea I have used many times. In the past, I have guest-hosted the feature for him, and I told him I would continue to take the reins of the weekly venture, as best as I can, in his honor, until the day he returns to blogging. Use the comment feature on this post to write your post. I hold it in moderation until all of them are submitted. If you want to podcast as well as write, please do (please?) One resource is PodcastPeople, which allows for easy, no hassle podcasts. Just create a show and provide the link in your post. So, go ahead and give it a try. It’s yet another way to connect with teachers around the world. PS — Here is my Week in a Sentence, as a sample. I heard some news this week of two of my former students who have troubled pasts and difficult lives and the news wasn’t good — both are already labeled behavioral problems and both are on the edge of the world, about to drop — just as I predicted and just as I strongly warned about last year, to no avail. As promised, I am sitting in for The Reflective Teacher (who may be off reflecting or something — not sure) and hosting his Week in a Sentence feature, which I have really come to love for narrowing my own week down and for reading the week of others. What a fantastic idea. Anyway, I will start off with a podcast. This comes from a workshop I gave at the Western Massachusetts Writing Project this weekend on podcasting, and as a hands-on activity, we created a podcast version of their own Week in a Sentence — with great results. Tickets to a Red Sox playoff game in my pocket – I SO did not want to teach this week anticipating my trip to Boston and my first playoff game ever! Go Red Sox! I modeled a writing lesson today where I tried to come up with writing ideas live in front of a audience of squirrelly second graders and it did effectively hold their interest. So thankful for the 4-day week; and now it’s wedding time–see you in two weeks! The power of and learning from collaboration has pulled me from Amherst, to Berkeley, to Billings and home again this week guiding my work forward. Fearing the worst, I was part of the faculty keep-them-from-fighting/escaping team during the very first pep rally in our new gym which meant that for the first time all 2,000 teenagers would be in a confined space being mightily pumped up by loud music, louder cheering, scantily-clad cheerleaders, popular sports dudes and a very loud microphone. I was wrong; they cheered and yelled and danced in the bleachers and sang and hollered for the teams and the cheerleaders weren’t raunchy and it was just: So. Much. Fun. Jody was thinking of chickens this week. That’s right — chickens. So … our school wide topic is ‘Things with Wings’ which brings me to having made endless phone calls (which led to other possible leads and yet more phone calls) in hope of finding some fertilized chicken eggs to hatch in class. I have the incubator, not eggs yet. Teaching – always taking me on a weird tangent or three throughout the week! If you missed the opportunity, be sure to go to The Reflective Teacher next week and add your thoughts. We’d love to read (and hear!) you. First, I have my own sentence. “Emotions– from joy to sadness — came through in the voices of my students as they moved from written page to podcast on an assignment to write a narrative paragraph about an object that brings up strong memories for them.” — You can even listen to their voices, if you want. Nani, another friend from the National Writing Project, had a very busy week with both writing and literature. Ms. Q just wants to stay home for a day and recuperate. Who can blame her, really? She probably deserves a nice quiet day for herself. Jody may not have meant to leave this as her sentence, but, well, here I go posting it anyway because, darn it, we all want to feel normal most days (but not every day). “Oh the joy, day in a sentence is on … thank you … another week of reading others words, relating and feeling almost NORMAL!” — Jody. MrC is going through the March syndrome: the month lasts too long. (Not sure if he meant hyphy or hyper but I left it as it was). And finally, my friend Bonnie, is contemplating the professional development work she does through her National Writing Project site. So, you may be thinking — I should have left my sentence! OK, Ok, go ahead, and use the comment feature here and leave your own. And then make sure you hop over to The Reflective Teacher and participate in the feature each week that it is offered. Remember, this is a community we’re building here. Thanks for reading and for submitting your words.